It seems Peter Paul Rubens was in complete control of every aspect of his life. He was talented, successful and happily married. Peter Paul Rubens is considered to be the greatest of the Baroque painters. Besides portraits the Flemish master painted altarpieces and historical and allegorical motives, tasks this classically educated and highly intelligent man was well suited for. Later in life Rubens also painted landscapes. Rubens was born a protestant, but his father died when Rubens was only eleven and his mother gave him a catholic upbringing in Antwerp. Until the age of fourteen he studied Latin and classical literature, after which he began his training to be an artist. Becoming an accomplished painter meant being an apprentice at the studio of a master for several years. Rubens studied under Tobias Verhaeght, Adam van Noort and Otto van Veen. At the age of 22 he was admitted into the Guild of St. Luke. Membership in the guild was required to be able to take on apprentices and to sell artwork. Peter Paul Rubens was a successful man in all his undertakings. He was the most important catholic painter as well as favourite artist at the courts in Europe. Among the masterpieces of his career is the suite he painted for Marie de' Medici, queen of France 1600-1617, with scenes from her life (the Marie de' Medici cycle). Rubens was frequently engaged as a diplomat. Between 1627 and 1630 he worked to negotiate peace between the Spanish Netherlands and the United Provinces, travelling between the courts in England and in Spain. Rubens was knighted by both Philip IV, King of Spain, and Charles I, King of England. Even in his personal life, it seems Rubens was a fortunate man. He married twice and both marriages are said to have been happy. His first wife, Isabella Brant, was the daughter of a distinguished citizen in Antwerp. She and Rubens had three children, but Isabella died of sickness in 1626. Rubens' second wife Hélène Fourment was only sixteen when they married; Rubens was then 53 years old. Hélène was Rubens' favourite model and she bore him five children. Extremely influential on Rubens' life and career was the trip he made to Italy in 1600, and that lasted for eight years. Several of the earlier masters, such as Michelangelo, Raphael and Leonardo da Vinci, had an immediate impact on his work. Rubens also studied paintings by Titian, Veronese, Tintoretto and Caravaggio. Titian was a particular favourite for Rubens, he copied or paraphrased no less than 33 of his paintings. An interesting example of this is The Fall of Man (1628–29). Rubens combined Italian renaissance with his own personal style, thereby creating the expression of sensuality and liveliness that is so typical for his work. He was a master in depicting the human body, and he is loved by many for his vivid coloring. 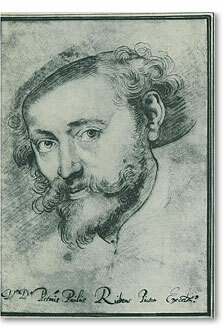 Peter Paul Rubens had a large studio in Antwerp with many assistants. The young Anthony van Dyck was an apprentice at the studio, and it didn't take Rubens long to recognize an exceptional talent in the pupil. Anthony van Dyck became a master at the age of 17, and was soon the leading Flemish portraitist. After van Dyck had opened his own workshop, he and Rubens often worked together. In those days, the assistants at the studio were often the actual painters. Rubens' oversaw the work and finished important details, such as hands and faces. The apprentices had to learn the manner in which their master painted. But of course, some paintings are entirely by Rubens' own hand. Some of Rubens' paintings are collaborations between specialists in different areas; Rubens painted the people, Frans Snyders painted the animals and Jan Brueghel the Elder painted the flowers and fruits, for example. The Rubenshuis in Antwerp contains many artworks by Peter Paul Rubens and his contmporaries. The Italian inspired house was designed by Rubens to be his home and his studio, and after it was built he spent most of his life there. Today the Baroque palace is a museum. In 2002, Rubens' Massacre of the Innocents was sold at an auction for $64.8 million.